189,000 acre-feet of water when full. Low speed boating and paddle sports are popular activities. The upper section of the reservoir, which is surrounded by the Carson-Iceberg Wilderness, is reserved for non-motorized use, and is a favorite of experienced kayakers seeking water access to secluded wilderness areas and a vast network of trails for hiking and backpacking. A 43-site developed campground and group camping facilities are available during the summer months, and there are a number of hiking and horseback riding trails to explore. The New Spicer Meadow Dam and Reservoir, commonly known as Spicer Reservoir, was named for the summer cow camp of the Daniel Spicer family from Salt Spring Valley. Situated on Highland Creek, a tributary of the North Fork Stanislaus River, the large meadow was flooded in 1990 by construction of the 262-foot high New Spicer Meadow Dam as part of the Northern California Power Association’s (NCPA) North Fork Stanislaus River Hydroelectric Development Project. The project, a joint development by NCPA and Calaveras County Water District (CCWD), spans 60 miles of the western slope of the Sierra Nevada, and includes the main Spicer Reservoir, two diversion dams and tunnels, the McKay’s Point Reservoir, the Collierville Powerhouse, and power transmission lines. It provides power to numerous communities throughout northern California. The relatively short diversion from the Scenic Byway on the paved but windy Spicer Reservoir Road will reward you with a spectacular, up-close view of the Dardanelles, which form the scenic backdrop for Spicer Reservoir. 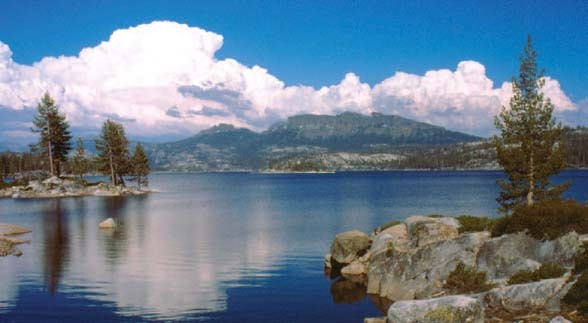 While away a pleasant summer afternoon paddling a canoe or kayak around the lake, fishing for rainbow trout, or just enjoying a picnic surrounded by the stunning high Sierra scenery. Although closed in the winter, a SNO-PARK just south of the intersection of Highway 4 and Spicer Reservoir Road provides access to snow play areas, and groomed snowshoe, cross country ski and snowmobile trails.